Pottery Barn Kids Summertime Giveway! My summer travel and camp plans are just about locked down, and this summer is going to be fully loaded. Now it’s time to stock up on essential summer gear and play items so my family is prepared for fun in the sun. Are you ready for summertime? Don’t worry, Project Nursery and Pottery Barn Kids have teamed up to help get your summer ready! Pottery Barn Kids is one of our favorite places to discover cute and useful summer gear no matter what’s on the summer schedule. Summer items like towels, beach wraps, water toys, room decor, beach bags and outdoor furniture have just arrived in the store. We’ve put together a little eye candy featuring our favorite Pottery Barn Kids items, AND don’t miss a chance to win the ultimate summer prize package below. Look at these fun options for summer play with your kids. Bring summer inside with some of these great warm-weather inspired pieces. Wouldn’t your kids love to take a seat at the Chesapeake Table & Bench Set with Chesapeake Umbrella this summer? WIN IT: In honor of all their fantastic new summer essentials, Pottery Barn Kids is giving TWO PN readers this fabulous Summertime prize package! HOW TO ENTER: To enter, visit Pottery Barn Kids, and let us know which summer items catch your eye with a comment below. Contest ends Friday, April 20, 2012 at 11:59pm PST. 1. “Like” Project Nursery and Pottery Barn Kids on Facebook, give us a shout out on our wall and tell us you did with a comment below. 2. Follow Project Nursery and Pottery Barn Kids on Twitter, tweet about it and tell us you did with a comment below. 3. Follow Project Nursery and “pin” Pottery Barn Kids images from this post on Pinterest and add your Pinterest link in a comment below. I’m always a big fan of the PBKids hooded towels. Multiple uses. What don’t I LOVE on their website?!! I want everything! :) mostly a snow cone machine. I love the rugby stripe duvet covers. I’m looking for some bold bedding for my son’s room. OOH! I have been eyeing the woven baskets forEVER! Gotta love child safe, stylish storage solutions! I LOVE the rugby stripe duvet covers. My little boy is growing into a little man and needs a room makeover – toddler style. This would be perfect! Plus the shark or transportation sheet sets are a must. I am in love with the sandbox! I follow both on Twitter and RT the giveaway! Love the duvet rugby cover , my little boy really needs a room makeover! Love the hooded towels! And, pretty much anything they have! I LOVE the summery duvet covers! Love the Chesapeake picnic table with matching benches. So adorable and perfect for picnics outside for the kids. Thanks for giving everyone the opportunity to win one! I’m already subscribed to the weekly newsletter. My son would go crazy (or batty!) for that Batman pool! In love with the chevron rugs! and the Adirondack chairs! I just received my Harper nursery bedding and PB diaper bag in the mail – we are doing a navy blue/nautical theme in our baby’s room (due in June) – i love all the nautical/boat items that PB kids has available now! The boat shelf, oars, artwork, etc. Love!! I “like” PN and Pottery Barn on FB!! I love the sleepover sleeping bags! Also, the Chesapeake sandbox and Adirondack chairs are amazing! I like both PN and PBK on Facebook! Love the Chesapeake set and the palm tree sprinkler! I love the Little Box of Gardening and wheelbarrow for my little girl. I already follow you on Pinterst and Facebook! I liked Pottery Barn Kids on Facebook. Oh I love the Chesapeake Gardening, Water & Sand Table! It is so cute and perfect to learn about gardening! Liked both on FB and commented. I absolutely love the Palm Tree Sprinkler and with the Miami weather, it’s the perfect summer fun item for my toddlers!! Just pinned you on Pinterest! Following PN & PBK and tweeted. And a subscriber for the newsletter! I follow project nursery on pinterest and I pinned pottery barn kids! Liked both PBK and PN on Facebook! Following on twitter and tweeted! I love the sea creature prints!!! I like both PN and PBK on Facebook. I love those Adirondack chairs. I love the whole Boy Surf bedroom. Really cute. I already receive your newsletter. Love the Adirondack chairs and Chesapeake collection! The color blocked wraps are super cute! Already a subscriber to newsletter! I am a fan of both pages and I signed up for the newsletter. My boy would love the shark duvet cover for summertime. I am obsessed with PBK beach totes. I live in FL they are a year round item for me! I love Large Mackenzie Girls’ Luggage. thank you! I LOVE PN on FB! I’m obsessed with the anywhere chairs. I can’t wait to get my little man one of his own! I love the wall decor and rugs. I liked ‘Project Nursery’ and ‘Pottery Barn Kids’ on Facebook. I love everything! But my favorites are Blue Turtle Kite, Seahorse Sleeping Bag, Boys’ Safari Sleeping Bags, Turtle Beach Wrap, Seahorse Beach Wrap, Bailey Duvet Cover and so much more. I love all of their fun towels…and you can personalize them! I like PN and PBK on facebook! I love the Chesapeake Sandbox with Awning!! My daughter and baby boy on the way would have a blast in it!! The Adirondack Chair would be fun for each kid so they have their own chair to sit on outside. I follow PN and PBK on twitter! Love the “gardening” toys/furniture from PBK. Like Project Nursery and Pottery Barn Kids on Facebook! I love the Chesapeake collection and the colored lantern strings would be such a fun addition to my deck! Love the Chesapeake table set! :) Beautiful! I already subscribe to the Project Nursery newsletter. Liked you both on facebook and wrote on your walls. I really like the gardening kit for kids and the adorable vegatable apron! I think I would get the Turtle Stripe personalized beach towel! the foam hopscotch set is such a fun idea!! I’m loving the turtle pool! I love the turtle stripe towel and coordinating beach wraps. Perfect for my 3 boys! I faithfully follow Project Nursery – thanks for the chance to win this great package! I love love love the picnic table – my son-in-love just built and adult version – i would love this one for the grandbabies…..Thanks for the chance to win. @PotteryBarnKids and @projectnursery have any amazing giveaway on PN blog! Hope I win! Already like PN and PBK on Facebook. Thanks!! I love those personalized beach towels! I like you and Pottery Barn Kids on Facebook (Michelle Hudak) and commented on your wall. I am in L-O-V-E with the Chesapeake Bench and Umbrella Set. I can not say it enough…I subscribe to both fabulous sites. However…Twitter, I am not a “subscriber”. (I don’t know how it works…) boo. I love PBKs in general! However, my son has his eyes set on the inflatable pirate boat pool and the sailboat bed. Thank you for the opportunity. I already like both you and PBKids on Facebook! Already following both you and PBKids on Twitter! I love the inflatable turtle pool…i want it! I am a PN Subsriber! My favorites are Chesapeake Table & Bench Set and the hooded towels and pool toys. I love pottery barn kids. I just bought the Dr Seuss hooded towel a few weeks ago. I already like project nursery and pottery parn kids on facebook! I like the Chevron Rug in grey. I “Like” Project Nursery and Pottery Barn Kids as Ps Mamae as gave you both a shout. like both Project Nursery and Pottery Barn Kids on facebook and gave a shout out!! Follow both Project Nursery and Pottery Barn Kids on Twitter and tweeted! Follow Project Nursery and Pottery Barn Kids on Pinterest and pinned!! The summer items that catch my eye and would love to get for my little girl are the Flower Foam Hopscotch mats, Chesapeake Sandbox with Awning, Sand Claw and the Bailey bedding set! I love Project nursery and Pottery Barn Kids! I love the “my little box of gardening” set! The table & benches! I like you both on fb! I follow Project Nursery on Pinterest and I pinned a PB Kids image there. I love the Shark Towel, Shark Kite, Shark Foam Hopscotch and the Chalkboard Flower Stakes Set. I like both pages on FB and wrote on both walls. Ooh, I love the table & chairs- would make my backyard complete! Oops- I follow both on twitter! I like On FB & commented on your wall! And I liked PB Kids and Proj Nursery on Facebook! I LOVE the table set! summer and bbq is the best way to bring a family together rather than sit in front od a tv and eat dinner!! Love it! I like both PN and PBK on fb!!! What don’t I love from PBK?! Some of my summer/outdoor favorites are the pink hat and diaper cover, the Fairfax stripe totes, and the Seahorse Stripe baby beach. I am already a subscriber to your newsletter! Old fashioned snow cone machine is great for kids parties or weekend fun in the backyward! Love the beach towels and beach totes, always come in handy. I love the Chesapeake gardening table! I grew up with a garden in our backyard, but being an urban mom myself, ripping up half of my postage-stamp backyard for tomatoes and green beans isn’t much of an option. What a fun thought that I could garden with my kids anyway! Follow both on twitter and tweeted! Gave a shout out on fb! I love the gardening tools, especially the kid-sized wheelbarrow! So cute! Like you both on FB!!! I love the Castle Inflatable Pool! I like PN and PBK on facebook and I gave you a shoutout! Little box of gardening looks great! I want to do some gardening with my kids this spring and summer! visit Pottery Barn Kids, and let us know which summer items catch your eye with a comment below. I love the Chesapeke Table and bench. They would look amazing on our new patio! Plus the inflatable pirate ship!! I want to play with that!!! Following on Pinterest also and get weekly e-mais!!!! Love your blog BTW! The Chesapeake Table and Bench Set definitely catches my eye! I am loving the Harper Roman Shade and the Harper Blackout Panel! We desperately need curtains for our nursery. I’m following Pottery Barn on Twitter! I like Pottery Barn on Facebook! I like Project Nursery on Facebook, follow you guys on Pinterest and subscribe to your newsletter! I like both PBK and Project Nursery on Facebook. Love the Palm Tree Sprinkler. So adorable. My kids would love the luggage too. Who are we kidding? They would love everything! I likes both pottery barn kids and project nursery on FB! I liked both pottery barn kids and project nursery on FB! I love the custom towels! I liked both on Facebook and I left a note on your wall as Christina Reyes! follow PN & PBK on FB….. I really like the Chevron Rug & Funny Fish Duvet Cover. “Like” Project Nursery and Pottery Barn Kids on Facebook. Follow Project Nursery and Pottery Barn Kids on Twitter + tweeted. Love all the Pb Totes especially the Faiefax otes….perfect for camp and your wonderful beach towels .My favorite is the SEAHORSE TOWELS!!!! Almost a Pottery Barn Summer! My son is just approaching the age where I can picture him spending his summer days digging in the Chesapeake Sandbox with Awning. He already loves playing in the sand at the beach. I love all of the GREAT beach towels! The turtle strip family towel looks like so much fun! Just subscribed to the newsletter. I thought I was excited about summer before, but the cute little adirondack chairs on the PB Kids site have me longing to lounge by the pool! I am loving the Chesapeake table set and girls seahorse sleeping bag! “liked” PN and PBK on Facebook! already a subscriber with a comment below. I love their Adirondack Chairs for kids. Love that they can be personalized as well! Love, Love, Love everything at pottery barn – right now really Chesapeake Table & Bench Set with umbrella…have been looking for a perfect outdoor table and bench that will fit both my 2 year old and 4 year old!! We are following both project nursery and pottery barn on facebook. Pinned on pinterest as mommapia:) Thanks for the opportunity!!! I “Like” Project Nursery and Pottery Barn Kids on Facebook and left a comment on your wall. I love the chevron rug, fish mobile, and nautical striped storage. I subscribed to the newsletters by email. I love the Chesapeake Table & Bench Set. LOVE IT! I am a subscriber to PB and PN on Facebook. The wheelbarrow would be fun to have. I can see the kids pushing dirt all over the yard and even each other. I love the baby beach wraps and the huge ball sprinklers! I like PN and Pottery Barn on Facebook! I would love the Chesapeake Table & Bench Set! I like PN and Pottery Barn on Facebook. The Palm Tree Sprinkler would be so much fun! I also love the outdoor throw pillows! I was totally digging the gardening stuff, that is, until I stumbled upon the Pink inflatable beach balls- THOSE ARE SO CUTE! These will be a must have item for our pool! I gave you a shout-out on FB! Love the outdoor soft toddler chairs! Already a fan on fb! Love the hibiscus beach ball sprinkler! I love the Hibiscus Beach Ball Sprinkler! I can only imagine what fun my girls would have with it! Like you both on fb!! i like Pottery Barn Kids on FB! already a fb fan of both!! tweeted and a follower of both!! I love the Carolina Collector’s Table. now following project nursery on pintrest too!!! I absolutely love the snow cone machine! So much fun! I liked Pottery Barn Kids on Facebook and gave you guys a shout out! I love the new summer stripe duvet covers in bright colors. Your can go for a modern nautical look using the bright green and navy! I love the ENTIRE Chesapeake Collection! And the outdoor Colored Lantern String Lights! I liked Project Nursery on Facebook and gave you guys a shout out! I can’t get over how cute the seahorse sleeping bag is. We are big campers so that bag would be perfect for our little mermaid! I love all the Pottery Barn beach towels…super cute! I am following Project Nursery on Pinterest and pinned PBK. I love the Madras Quilted Toddler Bedding set. It reminds me of a summer day at the beach! Already a fan of PN on Fb and just liked Pottery Barn. Just subscribed to the weekly newsletter! Looking forward to recieving it. i love the adirondack chairs, esp the little ones for my little one!!! I am following Project Nursery on Twitter! My two kiddos would love this summer table and bench set! I hope we get lucky! Love the PBK beach towels! !, already newsletter subscriber & liked both on fb. I’ve gotta get the pink inflatable beach balls and Octopus Sprinkler for my little one. Those and the amazing Chesapeake Picnic Table/Bench set and our summer will be complete! I’ve got to get the cool pink inflatable beach balls and octopus sprinkler for my little one. Those and the Chesapeake picnic table/bench set and our summer will be complete! I love the Little picknick table with the unbrella. My kid would love it. “Liked” Project Nursery and Pottery Barn Kids on Facebook! I love everything PB kids! My son loved the wheelbarrow when we visited the store last Sunday. I personally love the Chesapeake sandbox with awning. It would make a nice addition to our backyard play area. Love, love, love the Tavern chairs! Like PN and PBK on FB! Big fan of Project Nursery and PBK on Facebook. I already “like” both pages. I love the hop scotch set!! I like Project Nursery and Pottery Barn Kids on Facebook!! The Summer items are all amazing at PBK…I love the gardening stuff, the personalized adirondack chairs are awesome, and the kites are so cool. PBK is the best!!!!!! I like both Project Nursery and PB kids on Facebook! I receive the PN newsletter and love it! I love the beach ball sprinklers! My three-year-old daughter and one-year-old son would love it! I already “liked” Project Nursery and Pottery Barn Kids on Facebook. I just left a shout out on the Project Nursery wall. I just subscribed to the weekly newsletter. Love the personalized beach towels! i am LOVING the snow cone maker! I love the Skylar Toddler bed and my first chair! I liked both pages and gave you a shout out! Already a subscriber to your newsletter. We love PBK’s beach towels… Star Wars, Spiderman, etc. Thanks! Love the beach towels … follow PN on FB now. http://pinterest.com/pin/194921490092315554/ – here is my pin! I am totally in love with the sea horse sheeting and toddler duvet! I’ve been a subscriber to the weekly newsletter for about 2 years now! I like the Outdoor Turtle Stool – Green Stain! I’m big into Turtles and this is just so cute and practical! I actually love the Chesapeake Table with Two Matching Chesapeake Benches… perfect for my lil son to play and eat! I think all of the sprinkler water toys look like the most fun for summer! Our kids like most love the water when it’s hot outside. Pottery Barn makes some neat toys for summer. We would love to have the picnic table for our two kids, especially for when they have all their friends over to play! I really like their sandboxes! I am an email subscriber. Also in the notes above, I specificly follow Pottery Barn Kids on twitter and facebook! So hard to narrow down! I love the nautical striped storage, turtle pools, chevron rugs…lots more! Loving summer already! The Chesapeake Potters Bench for my daughter! She would absolutely love this, being an outdoor baby that loves getting into our gardening supplies. Ah, to have her own garden spot! I love the turtle beach towel! I love the Rugby Stripe Duvet Cover and the Adirondack Chairs! I like on facebook and must say I LOVE the Adirondack chairs with names. I love love love the rugby stripe bedding- woukd love to use them in our summer cabin! I like the Chesapeake Sandbox. I like project nursery and pottery barn kids facebook page. I just got new beds for my twin toddler boys. I love the Regatta duvet cover! and of course the chesapeake table with bench!! already subscribed to your weekly newsletter! I am following project nursery and pottery barn kids on twitter. I would love the silver bird set and adriana rug to complete the look of our new nursery! Following Project Nursery on pinterest and my info is serenaadkins. I like you both on Facebook and wrote on your wall! – and love this giveaway!! I love Pottery Barn Kids – can’t wait to order my new baby girl’s nursery stuff!! like PN & Pottery Barn Kids in Fb, commented on your page- Ashley O.
I love the chevron rugs, but I pretty much love everything. Love all the summer bedding! Very cool and soothing colors in the girl’s collection! I love all the beach totes :) I “like” Project Nursery on Facebook. I love the summer bedding and the Chevron rug! I follow PN on Pinterest! I always love the beach towels – every year! I’m a subscriber to PN! Love the sno cone machine and foam hopscotch! I liked PN and PB on FB and shouted. I love PBKids whats not to love. I am IN LOVE with the Chesapeake collection. I’ve been eyeing it for 2 years now. I really really want this for my kids. I’m SO new at Pinterest. Liked PBK and PN of Facebook and commented! I love the adirondeck chairs from PBK. The Summer quilts are cute! I follow you and PBK on twitter! I subscribe to your weekly emails! I like Pottery Barn Kids on Facebook! My daughter loves to garden. She’d adore the Chesapeake Potter’s Bench. And I Love those animal stools! Adorable!! Already like Project Nursey on FB! Just liked Pottery Barn Kids! I love the Chesapeake table from PBK! I am in love with the Chesapeake Table & Bench Set with Chesapeake Umbrella!! My girls would LOVE this for picnics this summer! I gave you a Facebook shout out and I like both PN and PBK on my Facebook! I am also following you on Pinterest and Pinned a photo of that amazing table! I am excited about your weekly newsletter! My 2 year old would love the palm tree sprinkler! I love the “My Little Box of Gardening” set! So cute, fun and practical! Love the table and bench set! Would be perfect for our yard! I love the brightly colored umbrellas! visited PBK and I love the Pirate Pool! Love the Chesapeake Potter’s Bench at PBK! My daughter would love the Turtle Pool! I follow Project Nursery and Pottery Barn Kids on Twitter and tweeted! I follow you on Pinterest and pinned this giveaway! Visited PB and love the Chesapeake set!! I love the palm tree sprinkler and the pirate ship!!!! SO much fun!!! I like both on FB and gave shoutouts! I love everything on their site but could definitely use some playroom storage. I love the striped beach totes, so bright and colorful for spring and summer! Love the Chesapeake Table and Chairs and the Salem Rockers! I liked Pottery Barn Kids on Facebook! I love the Chesapeake sandbox with the awning. It is so cute and would be great for my son to play in. I like PN and PBK on Facebook. I am subscribed to the PN newsletter! Love love love the PBK Chesapeake potters bench!! My 2 would love the Chesapeake Gardening, Water/Sand table. I follow PB and PN on twitter and tweeted. I like the Outdoor animal shaped stools. i love the sandbox with the bunting! like both PN and PBK on FB and shouted out on your wall! I visited the site and have to say that I’m glad they are giving away the Chesapeake Table and Benches because I love those and have been wanting some outdoor furniture! I’m a weekly subscriber. Love the Chesapeake table & bench set!! Love the PBK Wicker Elephant pedestal! I love the Chesapeake gardening table and gardening kit, or the snow cone machine! I love the kid’s gardening section. The wheelbarrow is so cute!! I Like you and follow the newsletter. Posted it on my facebook page and added it to one of my boards on pinterest. I love the chesapeake table, snow cone machine and the bright bedding. They each perfectly fit our lifestyle. I love these adirondack chairs!!!!!! they are adorable!!!! Love the beach towels and wraps, especially the stripes! Love the outdoor pools and water toys. Also, the picnic table and chairs would work great in the patio. Follow you both on Facebook and wrote on your walls! I am loving the Chesapeake Sandbox. I could just see my 1 year old digging and throwing all the sand her heart desires. Those striped beach totes and colorblock wraps would be perfect for our upcoming trip to the coast! I like pbk and project nursery on facebook. Love the freeport folding chairs with umbrellas and carrying bags. So will have to get these! I like the gourmet kitchen collection. I love their Adirondack chairs and Chesapeake sandbox! I follow PN and PBK on twitter. Liked you both on FB and posted a comment! I think the beach toyes are adorable! Following you both on twitter and tweeted! The beach totes are adorable! I am a PN & PB twitter follower! LOVE the Chesapeake table and chairs and umbrella! Love outdid floatable castle pool the most! Already a subscriber and love the newsletter! The giant beach balls look like fun! im an email subscriber, following you on twitter and liked you on facebook:) i would love to win this amazing giveaway!! I like the sandbox, and the inflatable balls! So fun to be a kid! I love the beach towels! The Boys’ Klean Kanteen® Water Bottles would be great for my boys football team practices in this hot Florida sun! Thank you! I love the Boat Rocker!!! Even though my little one is 3, I would still get it for him! I love the Adirondack Chairs and the Chesapeake Sandbox With Awning. Love the pink retro kitchen. My girls would love that. Would love to win. the giveaway. Need something to brighten us up in this house. Would be perfect. My two oldest children love to play hopscotch. The foam hopscotch set would be awesome!! Loving all of the items in the gardening section. LOVE that green wheelbarrow as well as the butterfly net! I follow pbk on facebook! The Chesapeake table and bench are adorable! I love the boys shark/plaid bedding and bunk bed! So cute! I love it all! I’ve always loved the Chesapeake table and benches! Been eyeing them for years! I love the table set and the totes!! I really like the castle pool and pink beach balls! I hope I win! We love the pirate pool and the snow cone machine! I LOVE the Chesapeake gardening, water and sand table! I love the new summer bedding for girls, especially the Lahaina line. And I love the octopus sprinkler, so cute!! I follow PN on facebook! Liked PN and PBK and also left a comment on both pages. Thanks! I lovd the Chesapeske table and bench set!!! Love the beach totes and towels! What doesn’t catch your eye, it is all eye candy. I do however really like the sandbox. I love the funny fish bathroom theme – the shower curtain & rug are so cute! I love the kids adirondack chairs! I already receive the weekly newsletter. Thanks!! We love the pirate ship pool and all the garden things!! Love the adirondack chairs and the beach towels are PERFECT!!! I love the chesapeake sandbox with awning! My kids would love that!! The Pirate Pool definitely is eye-catching! I love the Batman pool!! I love the Adirondack Chairs! I love the outdoor stuff, adirondack chairs and the totes for a day at the beach! I Like Project Nursery and Pottery Barn Kids on Facebook. already like pbk on fb. Love the table & benches! And all the beach accessories! I love the chesapeake sandbox with awning! My kids would LOVE playing in that!! We love the beach towels and beach bags! I love the beach towels, table & bench set, and palm tree! So many cute things to choose from when you are looking at anything Pottery Barn! I “like” PN and PBKids on FB! Wrote on the wall, too! I liked both on FB. Thanks! I love the car sheets for my lil man! Pinned and Facebook liked also!! Chesapeake Sandbox With Awning and the Pirate Ship pool! So cuteI I can just see my kids imaginations go wild with these! I like the Chesapeake sandbox with awning. So cute! Love the Chesapeake Gardening, Water & Sand Table! My son would love the Chesapeake Table & Bench Set. I LOVE all the outdoor things! My little girl LOVES to be outside! Love the adirondeck chairs and the sandbox with awning! I liked PBK on FB. I love the beach towels and the table, chairs and umbrella!!!! “Liked” Pottery Barn Kids and Project Nursery on Facebook! My kids would go crazy for the Palm Tree Sprinkler!!! The beach bags are so cute! I love everything in the Pottery Barn Kids catalog (oh, to have an unlimited budget!). My absolute favorite for summer is the pirate pool. I love the personalized totes! The sprinkler looks so fun! I love the little umbrellas that attach to the kids adirondack chairs! Following Project Nursery on Pinterest & pinned pics! I was just at PB Kids today admiring all of the beach-themed summer things! That Chesapeake table is amazing. That’s gotta be my favorite. I love the adirondack chairs and the tote bags for a day at the beach! I like both of you on Facebook and left a message on your wall. I lvoe the table and benches! Loving the PB towels too! I also liked Project Nursery and PB Kids on Facebook and posted to their walls! I love the personalized beach bags! I love the snow cone machine and beach bags!! Love the Chesapeake collection! So cute and liked ya’ll on FB! Following on pinterest too! I have liked pbk and project nursery on fb! I like both on FB. Love the beach bags & the adirondack chairs! My daughter and I love the Sea Horse bedding…so bright and fun! We also like the hooded beach towels. My daughter would absolutely love the snow cone maker! We are going to get the big inflatable water balls too!!! i must have the huge beach balls and the octopus sprinkler! so cute! the matching towels and bags r adorable…and i am sure the kids would die for the sno cone machine! “Liked” project nursery on facebook! I love the sno cone machine!! My 7 year old, along with his 2 brothers, would LOVE the sandbox! It is awesome! I love the kids rocker chair!! 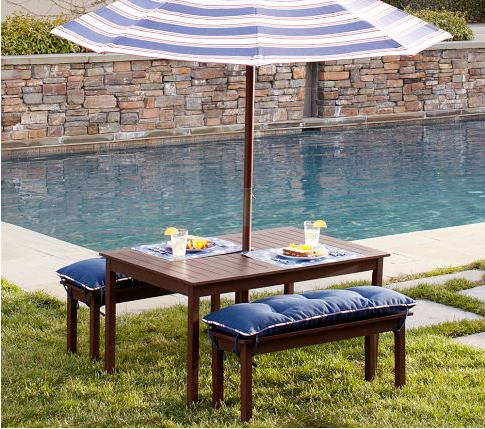 We love the Chesapeake Table, Bench & Umbrella for evenings & backyard picnics. I love the Adirondack Chairs, but my boys would LOVE the pirate or batman pool! Posted comment on facebook page! Aha!! I totally loved the beach totes,the colorblocked wraps for my baby and the seahorse sleeping bag!! Needless to say the chesapeake table and bench set is awesome and the best part is it’s perfect for indoor & outdoor too!!! Love all things PBK! I love the personalized Adirondack Chairs with mini umbrella and of course the Chesapeake Table and Bench set! LOVE the Chesapeake Table & Bench with umbrella! My little girl would ADORE it! I love the Pottery Barn Kids sandbox with awning!!! I liked Project Nursery on Facebook. I love everything in the Chesapeake collection, too cute!!! My boys are having a love affair with sharks this year and we love all the new “shark” offerings from bags to linens, it’s so hard to choose! I love the Summer Swaddling Blankets. “liked” project nursery on FB and subscribed to the weekly newsletter! I really love the Chesapeake Sandbox with Awning, and the Chesapeake Table & Bench they would be the perfect addition for the backyard in our new home! I LOVE LOVE the Chesapeake Sandbox! So cute!! The snow cone machine! What could be more perfect for summer?! I love the Chesapeake Table & Bench Set with Chesapeake Umbrella!! It would be great by our pool. A Table at kid height!! Love it!! Personalized beach wraps – my son loves his shark one from PBK and we will be getting him a second this summer! I am a tote mama!! I love them!! I’m an email subscriber too! I just love all the outdoor furniture for the kids. How fun! I also love the towels and beach bags. I like PBK & Project Nursery on FB! I really love the beach towels with printed name on it!!! Cute! I just pinned this table and chairs on pinterest! The Beach Ball Sprinkler is fun! Ah…Summer! I “like” you both on FB!!! OH MAN!!!!!!! the BATMAN BEACH BALL OR THE BATMAN POOL!! my son would go crazy over those!! he is a superhero fan big time!! thank you for the chance to win this awesome prize!! I’m following you on Twitter too!!! I love the batmobile pool, my boys would love it, too. I love the metal and wood chairs in blue and green!! They would look great with the Chesapeake collection…not to mention I have the PB Chesapeake dining table and chairs!! I “liked” Pottery Barn and Project Nursery on Facebook! I did! I LOVE Pottery Barn!!! I have been eyeing that table and benches for a few years now. Such a cool and classic style for both kids and parents to enjoy! PBK has the best furniture for little ones. just pinned the table and chairs!! Lucy Spivey: The snow cone machine! What could be more perfect for summer?! I love the pirate inflatable pool – too cute! My boys would LOVE the sno-cone machine!! I ‘liked’ Pottery Barn and Project Nursery on Facebook! I’m obsessed with the dollhouse bookcase! Love pbk! And I subscribe to the newsletter! Love the sprinkler beach ball, my kids would love it! Liked you both on FB! I love the striped beach totes and towels, how adorable…must get some personalized for my little man and baby girl! I love the snow cone maker, palm tree sprinkler, and all the small tables and chair sets!! I liked pottery barn kids and project nursery both on facebook! I’ve “liked” pbk for years and I just “liked” project nursery! We could really use the LOVE with our new addition in a few months. LIked you on Facebook and left a message! I love the summer bedding! My daughter’s room is the starfish and mermaid theme from last year!!! Love everything! Just bought the pbk easter basket with the liner and my daughter loved it. She def. did not complain that it was the largest basket at her egg hunts either! I’m in school full time and a single parent so I can’t go all out and buy everything, but if I could, I would probably buy everything at PBK! I follow you and like you on facebook. I love the chesapeake table. Its adorable and would be a perfect fit for my two littles. Love the Baby Beach wraps and hat/diaper cover. Plus the super cute sunglasses! I follow Project Nursery on Pinterest. I liked Project Nursery and PBK on Facebook. LOVE both pages on facebook and left a shout out on both pages!! I LOVE the pirate ship pool! But, honestly, what don’t I love from PBKids? I’ve always wanted one of their sandboxes too.